In this issue, we are focusing on the new Community Maps design and basemap updates. 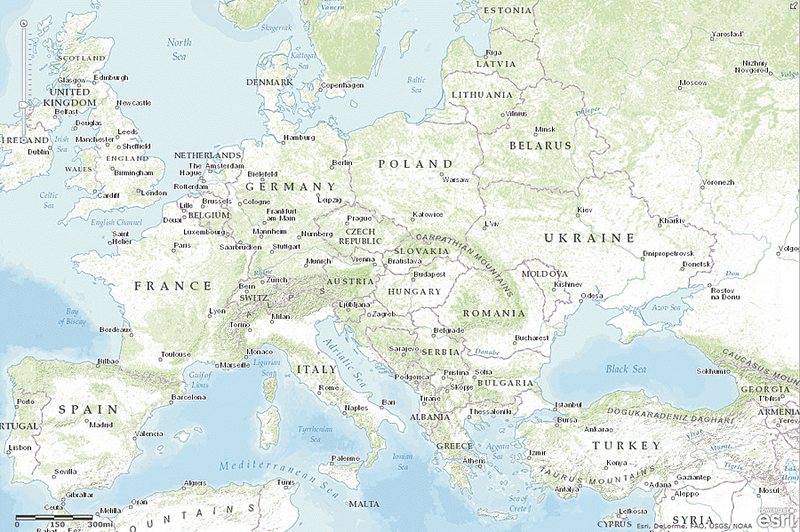 The new World Topographic Map design provides a muted background that makes your operational data stand out. 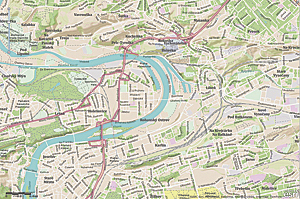 One of Esri's most popular basemaps, the World Topographic Map, or Community Basemap, is a GIS crowdsourced basemap that compiles data from the best available sources, including commercial data providers and GIS users around the world who contribute their content through the Esri Community Maps Program. 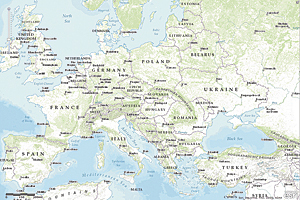 We recently redesigned the basemap to offer a more global appeal. The World Topographic Map now provides both a better background to overlay your operational data and consistent data across all map scales. Updated monthly, the World Topographic Map includes boundaries, cities, water features, physiographic features, parks, landmarks, transportation, and buildings. The initial rollout of the new design features global coverage from 1:591,000,000 down to 1:72,000 scale. In the United States, Mexico, and Europe, the new design persists down to large scales. At scales larger than 1:72,000, where there are program contributions or where NAVTEQ data is used (outside the United States, Mexico, and Europe), you will continue to see the old design. Also new is a dynamic attribution feature that ensures map content contributors are credited for their contribution. Based on bounding boxes, contributors will now see the name of their jurisdiction appear at the bottom of web maps in ArcGIS Online when panning over the map at scales where the contributed content is displayed. While this is currently available only in the ArcGIS Online map viewer, mobile implementations will follow later in 2013. As in the past, the World Topographic Map continues to receive the most contributions of authoritative content. Updates since the last column was written include the first contribution from a high school GIS class, which contributed content for Banning High School and Nicolet Middle School in Banning, California, at 1:2,000 scale. New and updated content from 1:9,000 to 1:1,000 scale is available for several areas in Canada, including Cornwall, Ontario; Val-d'Or, Quebec; Inuvik, Colville Lake, Déline, Fort Smith, Hamlet of Aklavik, Hamlet of Fort Liard, Hamlet of Paulatuk, Hamlet of Sachs Harbour, Nahanni Butte, Trout Lake, Tsiigehtchic, and Ulukhaktok, Northwest Territories; and Oak Bay, Regional District of Central Okanagan, Regional District of Sunshine Coast, District of Saanich, and Kamloops, British Columbia. New and updated content has also been added for international areas, including Europe and Russia at 1:288,000 to 1:1,000 scale; Canada at 1:360,000,000 to 1:2,000,000 and 1:577,000 to 1:18,000 scale; North America at 1:288,000 to 1:172,000 scale; Bosnia and Herzegovina at 1:577,000 to 1:1,000 scale; EuroPark Mielec SSE, Poland, at 1:19,000 to 1:1,100 scale; the islands of Aruba, Bonaire, Curaçao, Sint Maarten, Saba, and Sint Eustatius at 1:72,000 to 1:4,000 scale; Niedersachsen-Bremen, Berlin-Brandenburg, Thüringia, and Saarland, Germany, at 1:144,000 to 1:12,000 scale; the Netherlands at 1:72,000 to 1:1,100 scale; the University of Agriculture, Krakow, Poland, at 1:9,000 to 1:1,000 scale; Vienna, Austria, at 1:9,000 to 1:1,000 scale; and University Jaume I, Spain, at 1:9,000 to 1:1,000 scale. Several areas in the United States also include new and updated content at 1:9,000 to 1:1,000 scale, including Arvada, Boulder, Clear Creek County, and Greenwood Village, Colorado; Ashland and Dane Counties, Wisconsin; Boston, Massachusetts; Bucks County, Pennsylvania; Campbell County, Wyoming; DuPage County, Illinois; Florence County, South Carolina; Iredell County, North Carolina; Muscatine County, Iowa; Salem, Oregon; Sioux Falls, South Dakota; Bismarck, North Dakota; Taney County, Missouri; University of Washington, Tacoma, Washington; Duval County, Florida; Frisco, Houston, McKinney, and Grand Prairie, Texas; Hartford, Connecticut; and Bakersfield, Rancho Cucamonga, San Diego County, the Port of Los Angeles, Redlands, and Irvine, California. The Ocean Basemap was recently updated to include bathymetric data from the National Institute of Water and Atmospheric Research in New Zealand at scales of 1:4,600,000 to 1:72,000 for the country's exclusive economic zone. The new update also includes several feature corrections, improved rendering of the bathymetric data, and minor design changes. 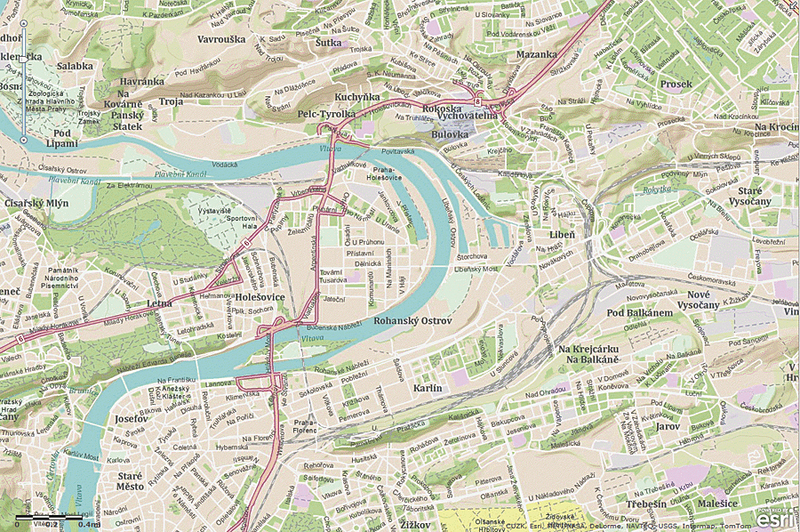 The goal of the Community Maps Program is to work with the global user community to provide effective, accurate, and freely available basemaps that anyone can use. Learn how you can contribute your authoritative content by visiting esri.com/communitymaps. Learn more about ArcGIS Online. Sign up for a free 30-day trial and invite up to five named users to participate in the trial. You get 200 service credits and Esri Maps for Office as part of your trial. When your trial is over, you can purchase a subscription and continue to use all the features and services in the same ArcGIS Online subscription account. To sign up for the trial, go to esri.com/agoleval.